Beside teaching and learning activities, teachers and students of Japanese Studies - Faculty of Oriental Studies - LHU encroach on academic playgrounds. These activities help students improve their communication skills and understand Japanese people and culture, which is very useful for their future jobs. Only in the last half of May 2018, they have won many impressive prizes at two big competitions for students of Japanese Studies. Also, some students are preparing to go to Japan to study. Beside specialization, students practiced Japanese language in many practical playgrounds and extra-curricular activities. Third Prize at "The 9th Japanese Skill and Spirit"
The 9th Japanese Skill and Spirit Competition was organized by Foreign Trade University in cooperation with Soul Magazine, Ohayo Japan, Ybox, Kilala Newspaper, Tuoi Tre Newspaper, Ebiv, Japo - Japanese Portal, Japanese JIDAI held in Ho Chi Minh City. This is also the place where Japanese Studies students can experience Japanese language and culture. Joining in this competition, Vu Thi Thuy Dung and Ho Ngoc Quynh Anh - Class 15DN112 had demonstrated their ability to speak and discuss in Japanese language as well as experience and explore the beauty of Japanese culture. They excellently overcame 100 other contestants from universities nationwide to win the Third prize. Thuy Dung and Quynh Anh took a souvenir photo with Ms. Nguyen Thi Nhu Thuong - Head of Japanese Studies and Mr. Tobita Minoru who fully support them during competitions. This is not just a beauty pageant for female students majoring in Japanese Studies. 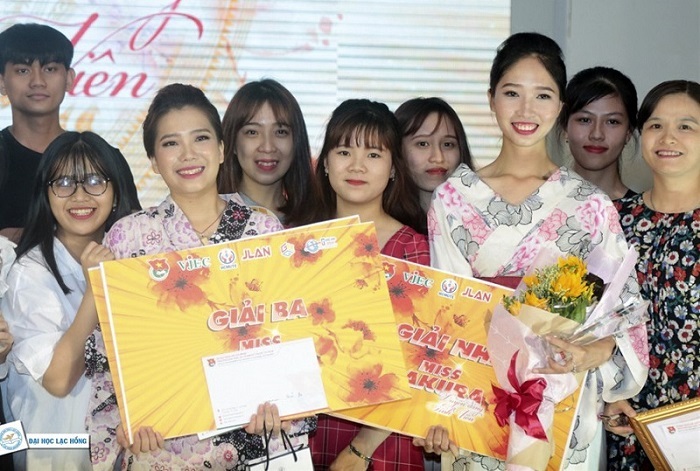 Miss Sakura 2018 is a part of the activities of the 6th Vietnam - Japan Cultural Exchange Festival organized by Giang Anh Group and Association of Japanese Education JLAN. Contestants were judged in criteria such as beauty, charm while showing talents and knowledge of the culture, behavior of the Japanese people and country. After many rounds, Both Le Thi Mai Huong (Clss 15DN115) and Le Thi Hang (Class 15DN114) ranked in the top 3. 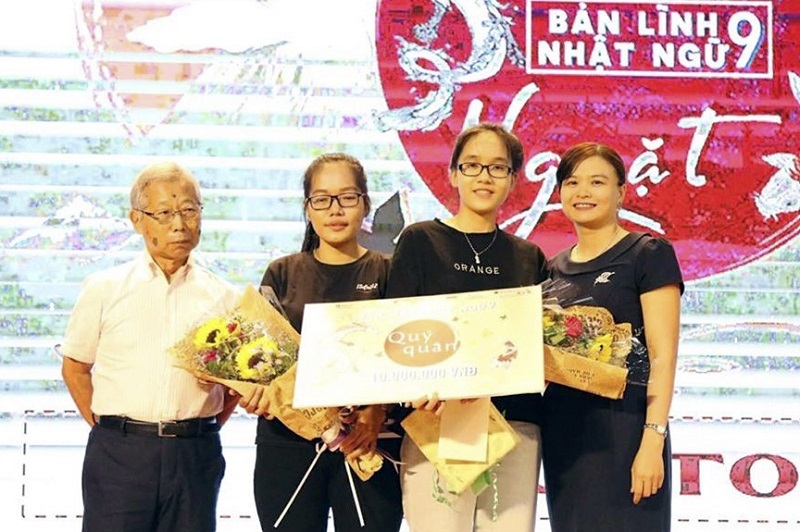 As a result, Le Thi Mai Huong won First runner-up and Best Answer prizes. 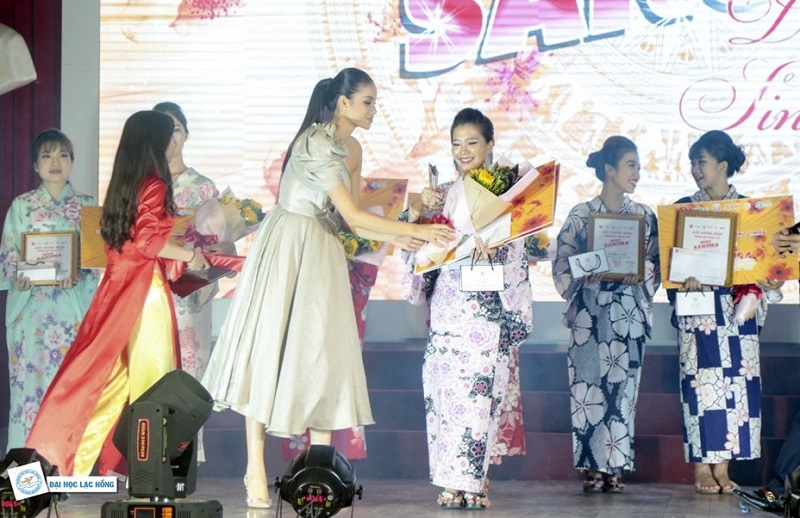 The Second runner-up and the most beautiful Kimono Performance prizes belonged to Le Thi Hang. Japanese Studies students shone at 2018 Miss Sakura Beauty Pageant. Meeting Japanese level from N4 and over, four students including Doan Van Linh, Nguyen Thi Huong, Nguyen Thi Thien and Phan Trinh Thuc Khanh received LHU's recommendation to study abroad in Japan. After the meeting with the KOBE International University's representatives (KIU), these students are preparing for Japanese language training program within one year. Representative of KIU met and talked with students about admission procedures. It can be said this May is unforgettable and impressive days of the teachers and students of Japanese Studies. Since its establishment date, Japanese Studies major has nearly 1,000 graduates who have made great contributions to the country's socio-economic development and promoted the exchange of relations between Vietnam and Japan. They are highly appreciated by the society and recruitment companies. In order to have such marks, apart from the efforts of each individual, it is also the companion and support of devoted lecturers. Here, each teacher plays the role of a leader, a friend who encourages their students to confidently come in new playgounds. Shining moment of Japanese Studies student with Miss Pham Huong. Students of Japanese Studies have many opportunities to receive scholarships granted by Japanese Government (JICA) and Japanese universities. Selecting Japanese Studies major is a right and timely decision. It will certainly meet the aspirations of students and parents. Japanese Studies major has never been attractive as now.